The girls soccer team tied St. Vincent-St. Mary last night 2-2. 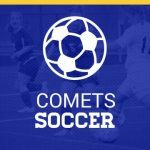 Scoring for the Comets were junior Belle Virag and junior Ashley Rafferty with both assists by sophomore Kyley Molea. Their record is now 1-1-1. They are next in action on Thursday vs. Field.